Tamerlaine Sanctuary is a not-for-profit organization dedicated to the rescue, rehabilitation and care of abused, neglected, and otherwise discarded farm animals. Established by Peter Nussbaum and Gabrielle Stubbert in 2013, Tamerlaine was founded on the idea that rescuing animals from industrial agriculture and introducing them to the public is one of the most powerful ways to create positive change for billions of animals and the world in which we live. Humane Education is our foundation and with our new property, we are able to expand as a sanctuary for farmed animals and a preserve for endangered wildlife and plant species native to our area. Meet the Animals of Tamerlaine. In 2014, we founded Tamerlaine Farm Animal Sanctuary to create a paradise for neglected and abused farmed animals. We currently have quite the flock, including animals rescued from factory farms, ritual sacrifices, urban slaughterhouses, and found abandoned, wandering the streets of New York City. We have clucking hens, crowing roosters, quacking ducks, oinking pigs, turkeys, goats, cows and almost 200 animals that call Tamerlaine Farm their home, all of them with their own unique personality and personal history. In December 2017, we purchased a 336-acre property right around the corner from our current farm. You can read all about it here. We are open to the public for visits and events so that people can connect with and learn to appreciate farmed animals as individuals. We frequently have volunteer days in which you can come up for the day and meet the animals, enjoy the beautiful property, and be treated to delicious plant-based food. If you are interested in volunteering, please email education@tamerlainefarm.org or check our calendar for upcoming opportunities. If you are interested in visiting, go to our "Visit" page and make an appointment. We are located in Montague, New Jersey, about an hour and a half northwest of New York City. We also sell a line of food products starting with our popular Hot Sauces! We sell these products at small markets in the tri-state area to benefit the sanctuary, with proceeds going towards our animal rescue operations. You can order our products online via our Market page! Tamerlaine Sanctuary originally sat on a 40-acre property, where only a portion of the space was useable for housing animals. Stunningly, an incredible property near our current facility came onto the market. Although a huge financial undertaking, we felt that this was a once-in-a-lifetime opportunity for creating change for farmed animals. The acquisition of the new property, also known as the historic Westfall Farm, began the next phase of our mission. 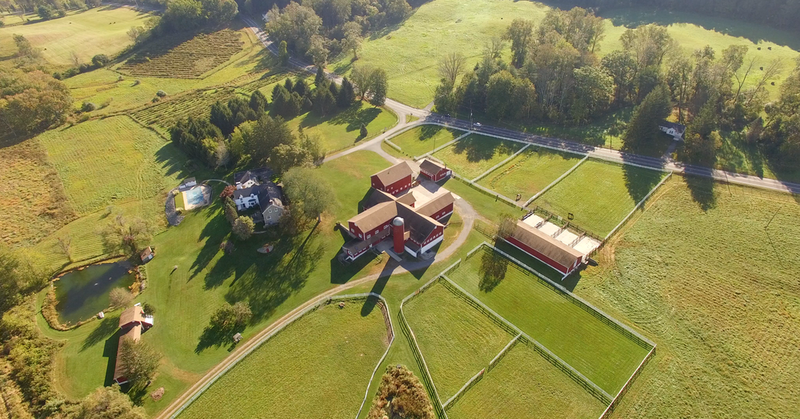 Our new 336 acre property is comprised of pristine and preserved farmland, equipped with beautifully maintained barns, stables, fenced in pastures, and hay fields. A charming colonial-era home overlooks the entire site. Now, with this new site and years of experience in farm animal rescue and care, and hosting visitors from all over the nation, we are poised to offer unparalleled opportunities for our community with a unique hybrid focus on well-being, conservation and animal protection. While assuming ownership of this site and converting it to an animal sanctuary accelerates our expansion plans, with your help, we will be able to execute this undertaking and embrace it with all of our energy, passion, and determination. The number of lives, both human and animal, that can be transformed, and the impact we can have for conservation in this new space will be profound. Our Vision is a world that is compassionate toward all beings especially the most vulnerable among us. We will continue to rescue and rehabilitate and provide lifelong care to animals, educate the public to create a more compassionate world, expand our conservation and eco-tourism program, and build a unique community alongside our inspiring supporters. Our dream for this sanctuary will gradually unfold with your help and the help of our community. Our initial projects are to build out a brand new animal hospital, new barns and aviaries for current residents and future rescues, a Monarch Butterfly Sanctuary, an education and visitor center, and an art gallery/event space. Join us in creating this incredible haven for future generations. To visit the sanctuary contact education@tamerlainefarm.org. If you can help, join our efforts by donating what you can or consider funding a project! It is many hands coming together that create change. Please contact us with any inquiries or comments. We would love to hear from you!